This is my second post today. For my Festive Friday/Holiday Inspirations Group post, please scroll down. It's hard to believe, but my term as a Girl Friday is over with this challenge. I was so thrilled and honoured when Michele asked me late last year whether I would be interested (um, YES!) and the time has gone so quickly! This somewhat-final challenge is really fun. Michele has given us a tic-tac-toe board and you choose 3 in a row (horizontal, vertical or diagonal) and make a card with those 3 elements. I really chose the top horizontal row - chevrons, black and sequins. But I accidentally also ended up with the middle vertical row - black, white and grey! And even more good news (for you) - there's prizes! If you leave a comment here, you will be entered to win a $20 gift certificate to CAS-ual Fridays Stamps! Plus, the winning card linked up to the challenge will receive a $50 gift certificate. All winners will be posted on the winner post on August 25 on the CAS-ual Fridays Challenge blog. The deadline for this challenge will be August 22 - I can't wait to see how your tic-tac-toe card turns out! satisfying two rows. what a happy coincidence! Great card...love that it's clean with a few pops of color! super love this...it's absolutely perfect! this is so pretty. Love the black row, flanked by the colorful sequins. I'll be using this idea. Beat wishes on your next endeavor. Love the accidental combo of two tic tac toes! Great card! Ardyth...I'm soooo far behind in commenting (and yes, I fully intend to catch up!) but had to pop in with a WOW for this card! Love the crisp black sentiment and chevron, and the colourful sequins. Two rows of tic-tac-toe = happy 'mistake'. I'll miss you as inspiration here, but...we know where to find you!! Love your card - so crisp and clean. Fun way to place sequins! OMGosh your card is AMAZING. I LOVE it. Thanks for sharing. Fun card! Lovin' all of those colorful, happy sequins!!!! Love the sequins Ardyth! I try all the time to use mine but they never seem to look right so they never make it on the finished card! Love the bold sentiment on this card! The sequins are the perfect finishing touch! This is such a fun card! Love the colourful sequins. Great card! Love the fun sequin colors along with the black chevron and sentiment! Delightful! What a fabulous way to display those pretty sequins Ardyth! Swoon, I love how you used those sequins Ardyth and the array of colors. I love how something so simple, with a few pretty sequins, can be such a festive card. Its fabulous!!! Beautiful card! Love the black and white boldness with the pop of color in the sequins. Great choice! 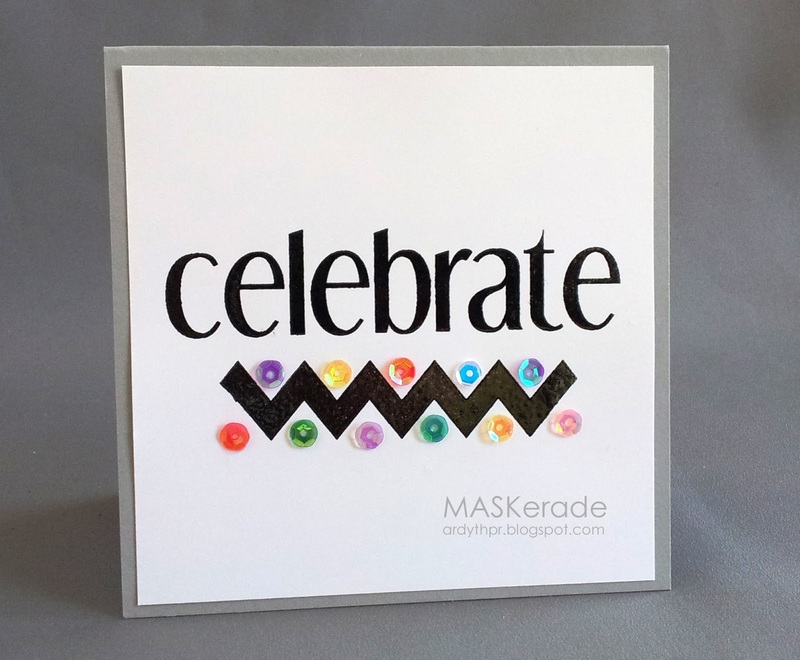 Love that big celebrate sentiment and fabulous choice of colors for the sequins. Love this, especially how you have placed the sequins. The sequins really pop against the black - awesome composition and design, Ardyth! Leave it to you, Ardyth, to "kill" two rows with one card!! Love this! This is so striking with the bold black lettering and chevron with those colorful sequins! You are the queen of CAS. Your simple, bold sentiment along with your perfectly placed sequins really make this a gorgeous card. I love the way you combined the sequins with the chevron: awesome! You've simply made the perfect CAS-card in every aspect of the genre. Love it! Oh! Two in one! Good job. Love the pop of color. Happy crafting! Love the bold sentiment and your use of sequins is GENIUS! Enjoy your little break. I am hoping to play with this challenge. This is such a fun challenge! I LOVE what you did with your three squares. Your card is super cute! Pretty, pretty card and I love how you accidentally did two rows. It's amazing how completely different your card is compared to another that chose the same theme. Great job!